Adidas is also making its mark in the wearable market by releasing miCoach Fit Smartband, which is a wearable fitness tracker which is based on the combination of Nike’s Fuelband and Adidas’ own miCoach Smart Run. Smart Run had an LCD, but the new MiCoach fit smartband is going to come with LED dot display. The miCoach Fit Smartband has a LED display which using the multiple LED dots will display the various fitness related features that are present on the fitness trackers. The miCoach Fit Smartband has a Heart Rate Monitor which works with the help of Green sensor present on the back side of the smartband, which is in contact with your hand and records the Heart Rate with the help of infrared light. Along with Heart Rate monitor there might be other features like Pedometer to keep track on the number of steps. The smartband has a Watch type design which most of the smartwatches these days are having, and the device can be controlled and settings changed with the help of three buttons on the front of the LED screen. 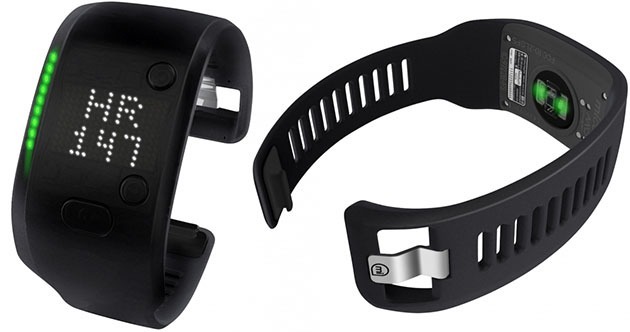 The smartband is connected to smartphones with the help of Bluetooth 4.0 LE or Bluetooth Smart. Adidas who had earlier released a model of smartband is making a comeback with this model by using LED screen to give better battery life ,and make it simple. And do what it is meant to do without many distractions in design or extra features. Adidas is also partnering with Google Fit as announced in the Google I/O event with the tag Fit in its device name, and also which means that the fitness data will be updated into the Google Open health program. The release date and the pricing be yet to be announced, and the details of the device specifications are also not yet officially released and we will be updating it once it is.